With new update to Version 1.0.9 there is new “out-of-the-box” function of the HTML Export extension– layer support! Now you can publish diagrams, and add optional layer management, to allow switching layers on/off on the published diagram. This allows to control diagram’s layers on the web to show/hide it’s parts. 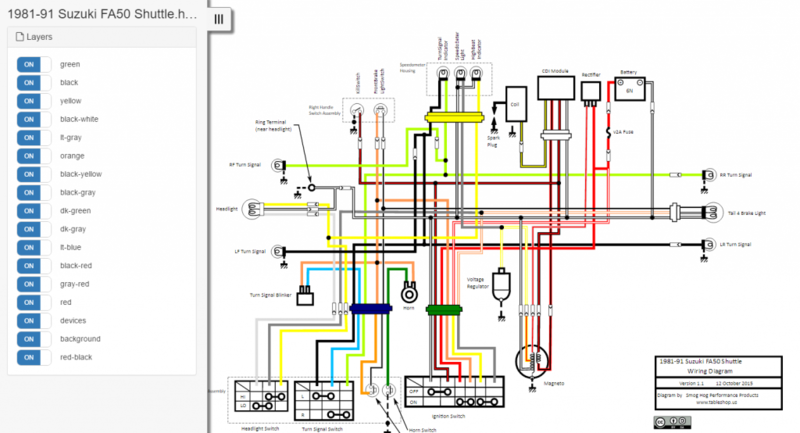 Check out the example: Suzuki FA50 Shuttle electrical schematic. Yep, in 1990s it was all pretty simple. You can turn on/off wires of the corresponding color by clicking the layer switch, to see what is connected with what. This is out of the box. Alternatively (this part is provided by extra tiny script) – you can turn layers on/of by clicking shapes. For example, if you click a lamp, all wires which are connected to that lamp will be turned on/off. Click the picture to go to live diagram. “You can turn on/off wires of the corresponding color by clicking the layer switch, to see what is connected with what. This is out of the box.” –> How do I do that? And also, how do I define which elements belong to one layer? I have an existing diagramm and when I publish it with Show Layers selected, it comes up with some random names of layers in the output and nothing happens when I switch the layers on and off. I have downloaded the Suzuki example, but I cannot figure out how the layers are defined there.